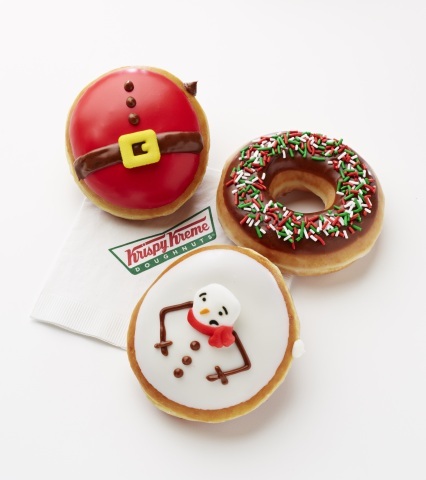 "These products were created with that mission in mind, and we are thrilled to offer the Melted Snowman Doughnut, Santa Belly Doughnut and Toffee Mocha throughout the holiday season." 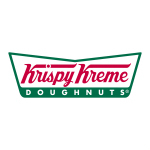 WINSTON-SALEM, N.C.--(BUSINESS WIRE)--Krispy Kreme Doughnuts today announced a holiday-inspired line, including the Melted Snowman Doughnut, Santa Belly Doughnut and Toffee Mocha beverage. 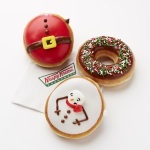 These seasonal favorites will be available today through Dec. 25 at participating Krispy Kreme shops in the U.S. and Canada. The Santa Belly Doughnut is a favorite holiday treat. The doughnut is first filled with Hot Cocoa Kreme filling before being hand-decorated with chocolate icing and a candy belt buckle candy. Stop in at a participating Krispy Kreme shop to get the season’s most delicious treats and use #KrispyKreme to show off your holiday cheer.